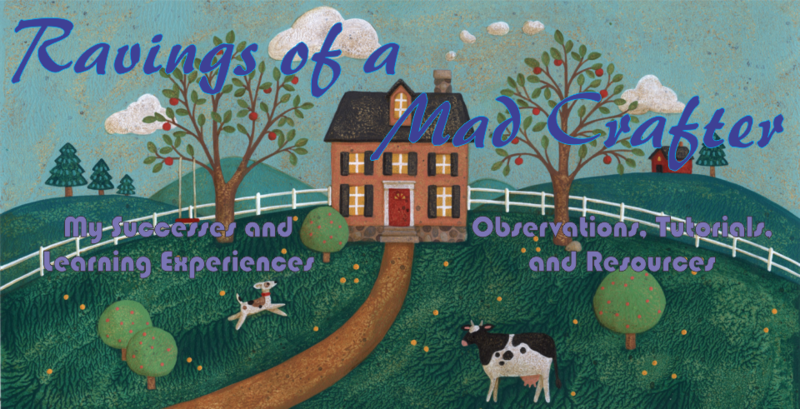 In two weeks I will be giving another workshop at the Orcutt Oasis Center Someone donated a large number of mason jars and they asked me to come up with an idea. They wanted a hanging lighted jar so I looked around the internet and then made my own decorated jars. The first jar is made using coffee filters roses. This was the first time I've ever used coffee filters. 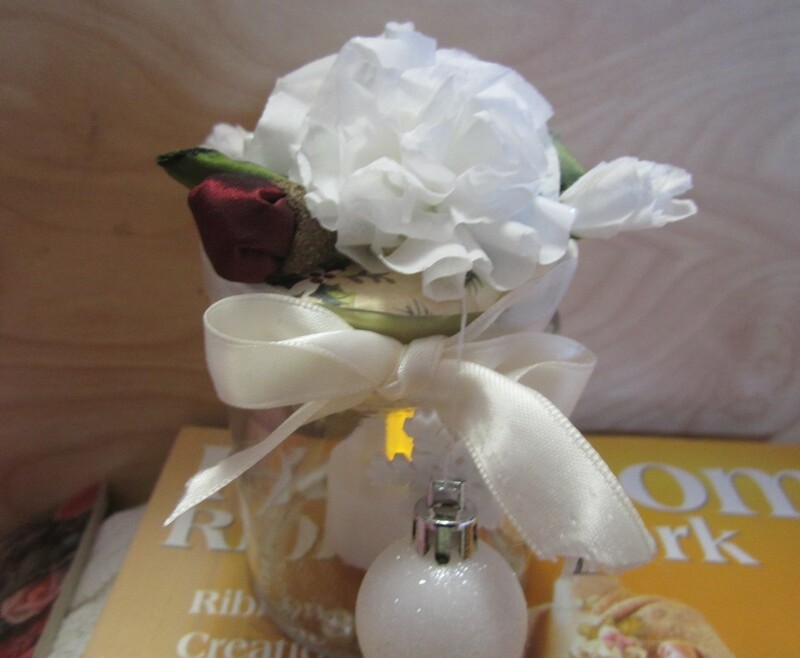 The flowers were very easy to scrunch up and glue into rosettes. Next I cut out decorative paper to cover the top and side of the jar lid. Then covered the lid side with a simple ribbon. 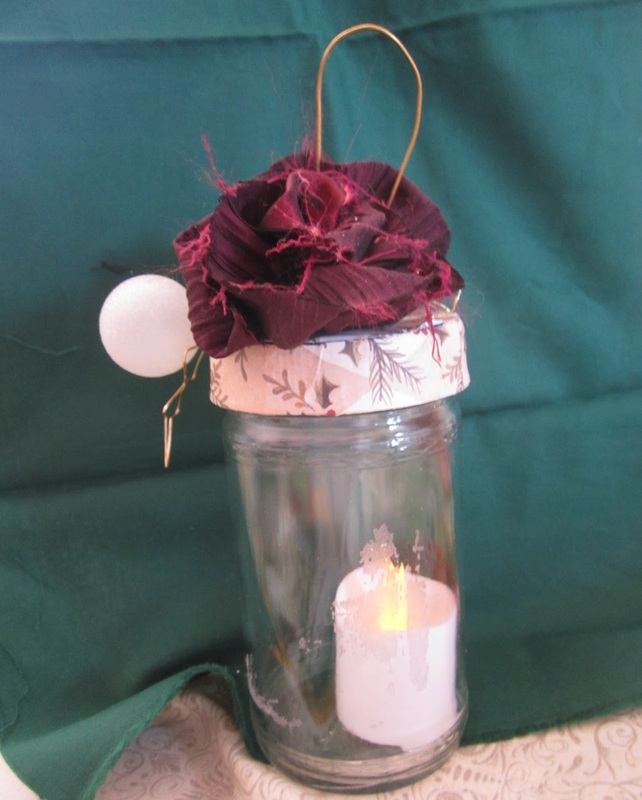 Then using some leftover paper from the roses I created two rose buds and glued green ribbon around the stem end. The red berry is a simple gathered circle, like a yo-yo. Then I glued the berry into an acorn top and on the jar. Finally I made some prairie point leaves out of green ribbon. The small round ornament is from a store and cost 10 cents. 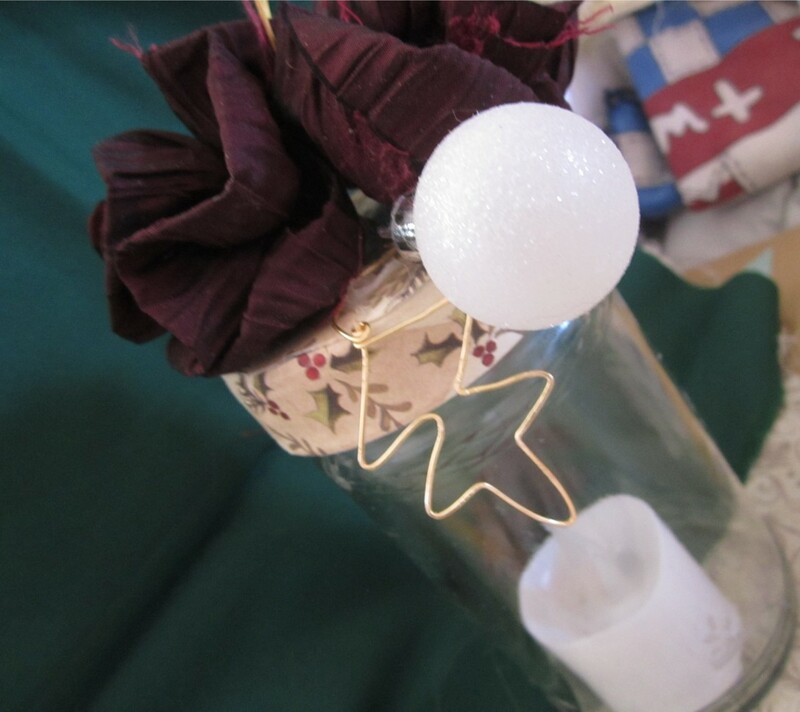 Jar decorated for Christmas using coffee filter papers. 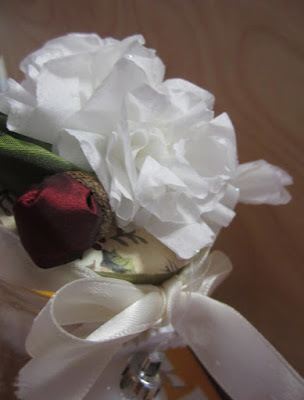 Close-up of coffee filter rose and acorn topped berry. Second jar design. 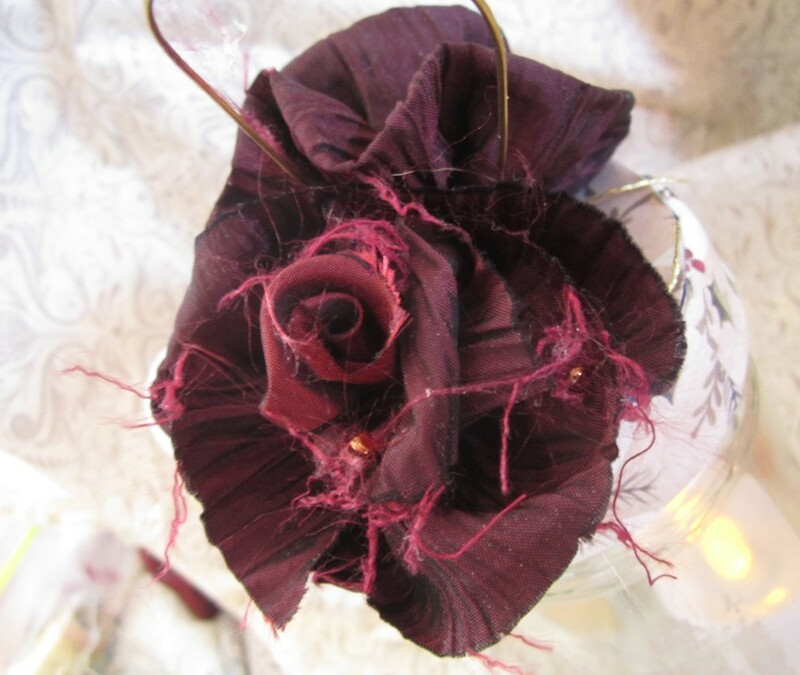 Made with fabric roses. The gold at the top is a hanger. I decided to design a second jar for two reasons. First some people prefer a red and green themed Christmas light and I also wanted to show how to create flowers using fabric. 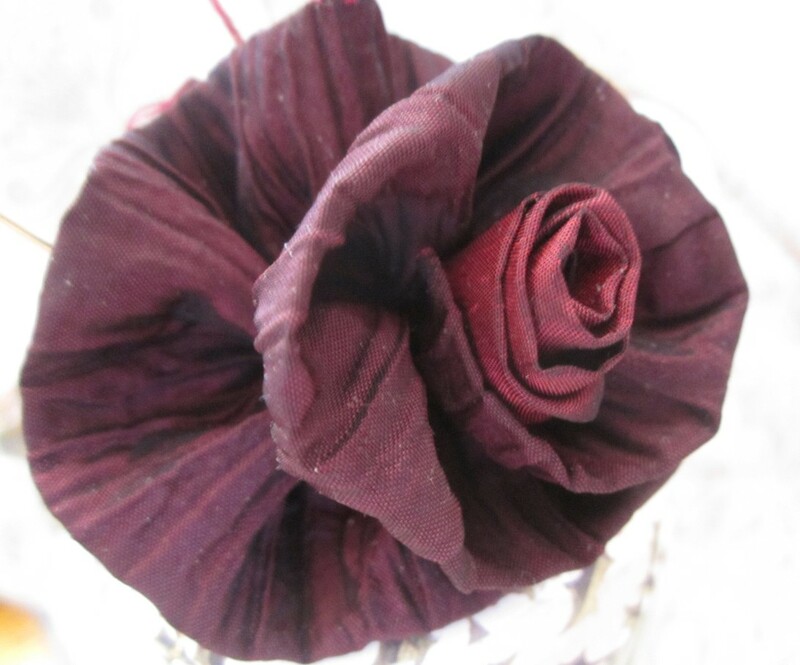 Close-up of fabric rose with edges showing. The edges cause the rough thread look. Close-up of the same rose technique but the edges are folded making a neater flower. The metal leaf shape was made by bending 20 gauge wire and using a chasing hammer on an anvil to flatten it. 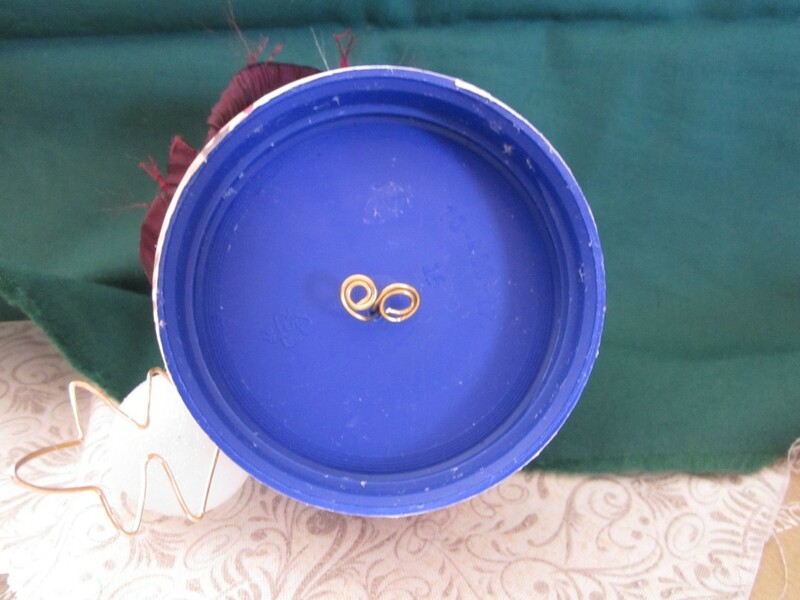 In order to secure the hanger both ends of the wire were pushed through a hole in the lid, then the ends are twisted in circles to finish. Battery powered tea lights and small candles by Living Colors, Candles. When finished all they needed were some battery powered tea lights! These were purchased from a Dollar Store. 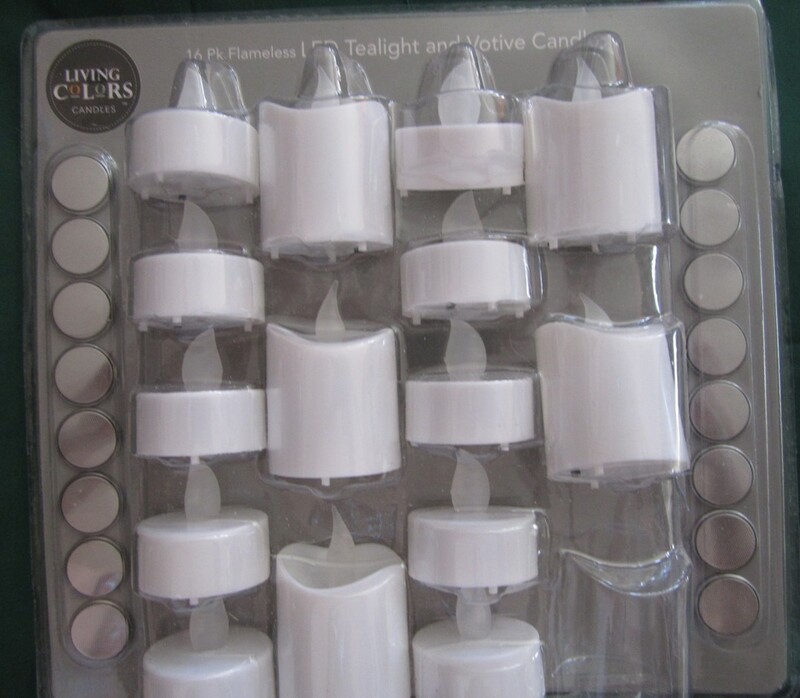 The ten tea lights for $6.00 and sixteen assorted lights for $10. The packages also included replacement batteries. 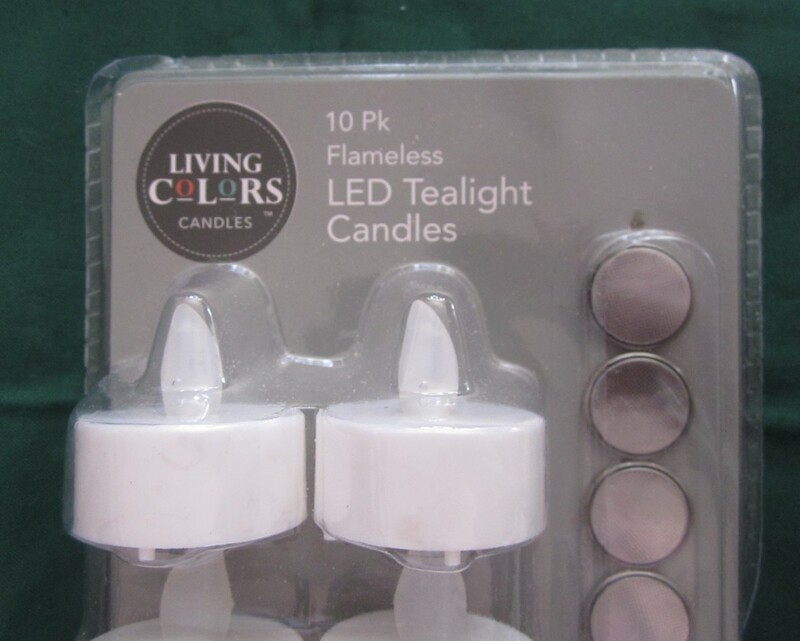 I was sceptical at first, so I ran a test and the tealights ran for eight days straight. The light was rather dim after eight days but turning the light off for 30 minutes helped to restore the brightness a bit. These are great lights and I hope to get some more of them. Altrusa Tree Finished for 2015, lots of pictures!